1) VERY NICE ROAD WARRIOR WIN. 2) We said it all week, the Giants OFFENSE needed to step up and score 40 points to win this game… they did and the team won. 3) Eli Manning was outstanding. Akin to the Bengals game, the AZ defense gave the Giants a lot of 8 man fronts. The Giants were not going to run for 200 yards today, so Manning and the passing game had to answer. He answered emphatically. End of midseason malaise. The stats will not do Manning justice. He managed every single phase of the offense beautifully. He was 26/33, but of 7 incompletions at least 3 or 4 were dropped by his receivers. 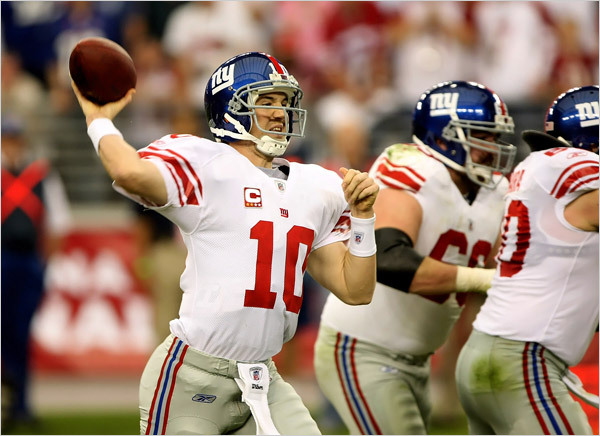 One of the things that is always there in Eli’s game is his control over everything. He knows exactly what he wants. Granted he had problems with crowd noise early, but he managed that too. And then there is the way he steps into the pocket when the pass rush is coming. It buys him that extra split second and that means the difference between winning and losing in the NFL. 4) The officiating was horrendous. This is such an old story in the NFL this season. The point here is this is why the Giants need to strive to eliminate ALL mistakes… because these refs are so terrible that you do not want to let their arbitrary decisions cost you the game. So the Giants won despite more than a few bad calls. Good for the Giants. 5) Manning took a beating on a handful of plays. There were a few times where he got driven into the ground WORSE than the horrendous call when Tuck was flagged for a personal foul (against Dallas 3 weeks ago). The hypocrisy is incredible. 6) The Giants run defense was never challenged. 7) Carney is gin on the short FGs, but his lack of leg is hurting the Giants’ kickoff coverage. 8) Before anyone gets too excited about this Giants win, please remember that the Giants got TWO turnovers from Kurt Warner (resulting in +10 points for the gmen) PLUS one failed onside kick attempt (+3 points) PLUS two fantastic Hixon kickoff returns of 68 and 83 yards (+10 points). So those little nuggets added up to 23 points of the Giants 37 total scored. Yes, they all count, but the message is that down the road the offense is going to need to keep scoring on offense because opponents like the Cardinals (and other teams with good QBs) will score. CONTINUE TO USE THAT OFFENSE TO WIN GAMES. 9) Lots of players need to be singled out in the game. Of course Hixon pulled another performance like that against Seattle. Give him the minutes (on the offense AND on kickoffs) and he is an impact player, period. Phillips looked very good out there today. His speed in the secondary allows him to cover a lot of ground, and you see that when he closes in on plays, either stopping a TD (Fitzgerald, Q1) or containing plays and eliminating yards after catch. (Daryl Johnston did a good job of pointing out how the Giants defense did a great job of containing YAC.) And then there are the players you simply do not hear from, like Corey Webster. The silence is deafening. He is anchoring the entire secondary right now because he is quietly shutting it down. Against the best. Of course there is Pierce, who as traffic cop, according to Goose, was calling Arizona’s run and pass plays before the snap, as well as (according to Johnston) calling for Thomas to move over to a certain position before the snap, which led to his INT. 10) Gilbride. He still is predictable in the second down and 10 yards or less after a first down pass play… you know a run is coming. But that said, he called a very good game because (a) he went away from the run when the Cardinals were loading up at the line and (b) he did NOT go into the prevent offense with 4:02 left. Excellent. He and Coughlin respected Arizona’s offense enough to know that they had to demand enough of their offense to WIN the game instead of asking the defense not to lose it. And win it they did, by driving 30 yards to the AZ 16 yard line for the FG. 11) It is almost not worth noting, but I will post the obvious. Everyone in tomorrow’s media will be glowing about how the Giants won without Jacobs and Burress. For many on this blog, we know that the success of the Giants and the offense in particular this season has not been about those two players. So when one or both were a threat not to be in the game today, there was EXACTLY ZERO alarm this week from this corner because the Giants are so browning loaded at RB and WR that this team was not going to miss ANYTHING. I for one was actually salivating at the thought of guys like Hixon and Bradshaw getting more minutes. These guys are not only ready for primetime, they ARE primetime. So let the media fawn over the Giants winning on the road w/o the “name” stars of Jacobs and Burress… the real name stars who are indispensable are Diehl, Seubert, O’Hara, Snee, McKenzie and Manning. When the Giants win without those 6 guys, we can gush. This entry was posted on November 24, 2008 at 2:42 am and is filed under Brandon Jacobs, Burress, Chris Snee, David Diehl, Domenik Hixon, Eli Manning, Kareem McKenzie, Kevin Gilbride, Rich Seubert, Shaun O'Hara. You can follow any responses to this entry through the RSS 2.0 feed. You can leave a response, or trackback from your own site. Only one small disagreement. The Cards where able to put 8 in the box because Plax was not in the game. Teams don’t fear Hixon enought yet. They don’t believe that Hixon can beat them so will continue to load the box untill Hixon beats them again and again. I was very happy Jacobs was not playing so we could see 44 alot more but it never happened.Baring major injury, i see a subway superbowl this year. the jets are the cream of the AFC and they are just getting better and better. PSEli was FANTASTIC today. It was the best I have every seen him play. A complete game from begining to end. Nice summary A. I think we just a little excited to see Hixon and Bradshaw get more minutes. Hixon has to be the focal point of their return game from here on in as I pointed out earlier.Manning was a capital A+ today with command, execution and accuracy. This team is loaded on the O line of the ball.D played better that score as again, as A. pointed out, the Refs were awful. The NFL needs to address this as this is the worst year yet. I am jacked up to see Thomas and Phillips in the near future…both showed their talents. Tuck is under appreciated and held obscenely.We are now 3 games up in the conference! Don’t agree about refs. most of PI calls where good. Ross can’t arm bar. giants got luck on some none calls also so it all evens out most times in the end. What I don’t like about refs is non calls on tuck. reminds me of stray. he got helded on every play also. if they called the holding against those guys the opposing O would never score any points and the NFL can’t allow that. the calls were so nauseating, I did not even bother to track all of them. On the cardinals’ first drive, for instance, the Giants got robbed on a HORRIBLE spot, a motherbrowning crock of brown spot that gave them the first down. I would have challenged the spot, that is how bad it was. it gave them a first down and it should have been 4th down for a punt.as for plax, it all boils down to what the defense gives u… in this case, they were not going to double hixon, so the Giants used him more and that was okay. AZ was going to put 8 men in box, plax or no plax. they were committed to stopping the run, we have seen that movie before and it ends when Manning passes the ball. The PI call on Ross on that 3rd down play at 24-12 was bogus. Fitzgerald and Ross BOTH had their hands on each other a bit, but both were also attempting to make a play on the ball.Nothing wrong with that at all. Let these guys play. If teams want to start putting 8 in the box against this team (or 9-10 like the Cards did on several plays)…then let them.Eli will beat them. He’s proven he can do it time and time again–he’s a great QB with great weapons. This is why this team is so damn good. Dont stack the box? The run will kill you. Committ more guys to stopping the run? then the passing game will kill you. Pick your poison.Now with Hixon FINALLY back returning kickoffs…we now have a serious threat in that area too.The only weakness I see with this team is their kickoff return coverage. With all the discussion about Earth, Wind & Fire, Osi Umenyiora's season-ending injury, Michael Strahan's retirement, Plaxico Burress' child-care challenges and an offensive line that gets better every week,(I still like "Block n' Blue") Manning has been about as inconspicuous as a Super Bowl-winning quarterback can be.Time to put Eli back on the radar. In a game that required the services of big-time quarterback play, Manning did just that to keep the Giants' train moving at 10-1. Cardinals put 8 or sometimes 9 in the box…so what? The best way to counteract that strategy is to pass the ball effectively. Not only does it move the chains, but it often makes the opponent think twice about devoting so much attention to run support. Eli just passed to about everyone on the roster. Even Madison Sledgeblock caught a TD pass and we got to see his "rowing dance celebration"Manning came out throwing immediately and picked apart the Cardinals' secondary If there was one signature drive for Manning yesterday, it was this: The Cardinals closed the gap to 24-19 late in the third quarter and all that Manning did, was take the Giants 80 yards in 10 plays, essentially putting the game away. When the game is on the line, I want Eli at the controls. He is a tremendous field general who does whatever is needed to win.I don't want to discount the defense because if you just looked at the score and 300 plus yards that Warner threw…it was very deceiving. The line pressured Warner (which they had to do) The DB's were awesome. They played physical and limited the YACS. That was key. As Andy stated, Phillips shows tremendous closing speed. (I saw it at training camp this summer and couldn't wait for him to crack the lineup) Yes…they had penalties, but they didn't back off and continued to be physical with their WR's. Oh…can we finally stop seeing Bradshaw on kick returns and hand the keys to Hixon, once and for all?Also those "Mother-Handley-Ref's" didn't help but we perservered. I like both the Buck/Aikman/Oliver crew and the Albert/Johnston/Siragusa crew. Considering that two divisional leaders were matched up in the Giants Cardinals game I’m surprised that FOX didn’t have BAO there. Instead that crew did the Cowboys/49ers game. i have been pushing for hixon to return kos, he is obviously better than b-shaw.not that ward did badly, but i was disappointed b-shaw did not get many carries. i was hoping for at least 10.i loved the 3rd down play where hixon ducked under a tackle and fought for that yard to get the 1st down.that crap about eli not being a leader because he is not loud and theatrical always pissed me off. joe montana is a complete bore but he did pretty well. eli is the same: a quiet killer. hypothetical situation:if carolina and dallas are tied for wild card at the last week of regular season, should Giants purposefully lose to Panthers? Hey Blaze, the Giants play the Vikings Week 17. Nonetheless, if your scenario was true the answer would be no. The GMen proved last year that, no matter what, you play to win the game. If the Giants have to beat the Cowboys three times this year to play in the Super Bowl so be it. Jblaze and Oxbay, sounds like a post topic for tomorrow morning. I know the subject has been beaten to death, but my dismay at Bradshaw’s lack of playing time hit new heights on Sunday. Check it, they’re always saying that Ahmad’s on the sidelines because the jacobs-ward-bradshaw caste system works. But with Jacobs out of uniform, why would AB only get a lousy 3 carries? It didn’t make any sense. The announcers said it was because the Giants wanted him to have “fresh legs.” What’s the point of fresh legs if they don’t run? the bradshawlics on this site are as frustrated as you are. we have been relegated to psychoanalyzing the coaches, psychoanalyzing Bradshaw, thinking about maybe Bradshaw fumbling in practice, Bradshaw missing blitz pickup in practice etc… and we come up empty.